Ubisoft has reluctantly and entirely unsurprisingly confirmed that the PC version of Assassin's Creed IV will launch "a few weeks" after it comes out for consoles. Ubisoft earned itself some brownie points with PC gamers last year when it announced an end to its much-hated, always-on DRM, but the publisher is clearly having trouble letting go of all its bad habits. 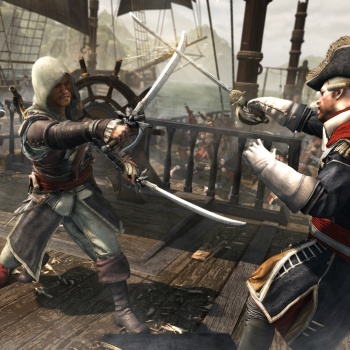 When last we checked - earlier this month, in fact - the PC version of Assassin's Creed IV was slated to launch on October 29 alongside the Xbox 360, PlayStation 3 and Wii U editions, but Game Director Ashraf Ismail revealed at E3 that, in fine Ubisoft form, it will actually be pushed back an indeterminate amount of time. "In North America we're releasing on October 29... PC will come a few weeks after," he told Elder Geek, with a sheepish grin that said he'd really rather not have to talk about it. "We're actually working hard on the PC version, it's one of the main platforms we work on in the office, so we'll see about... to be honest, I'm just the creative guy. I might even be wrong about that date, it might actually be sooner." "For our PC fans, don't worry," he added. "The game on PC looks phenomenal." That's nice to hear, but I don't think how it looks is really the issue; I think the real concern is that it's an unnecessary delayed caused by what I assume is Ubisoft's ongoing fear of console sales being gutted by rampant PC piracy. It's not exactly a shocking development, but it's still silly and disappointing. So, to update: Assassin's Creed IV will launch on October 29 for the Xbox 360, PlayStation 3 and Wii U, but the PC edition is now TBA. Versions for the Xbox One and PlayStation 4 will be released alongside their respective consoles.